If you’re in charge of an auto repair business, we’ve got the lowdown on which online platforms you should be using to expand your customer base. Not to toot our own horn, but True Local is very useful in getting your business out there, but not many businesses know how to make True Local work for them. First, there’s the basics. Reviews are essential in proving your trustworthiness to potential customers and help to close the gap between consideration and booking. Your True Local page is also the perfect spot to show exactly what you do so customers know if you can help them specifically. For instance, if someone needs their radio fixed, they’ll be much more likely to come to you if you mention that you specialise in auto-electrics. You can also use your page to highlight special deals, accreditations, and anything else that sets you apart from your competitors. What’s more, True Local is a local business community and listing on True Local means you get VIP access to all our digital know-how. Attend valuable events like online marketing seminars, or soak up our advice, tips and tricks on online marketing for small business. We also provide opportunities for businesses to feature in our marketing campaigns, on our social media pages, blog articles and email newsletters. Small business is our passion! Finally, list on True Local because we provide an invaluable boost in your local search engine ranking. That means if somebody Googles your business or a service you provide in your area, you’ll be likelier to show up first in search results. Your review star rating will also show up along with your listing, increasing the likelihood that people will actually click to find out more by 54%. What’s more, we have the technical prowess to optimise site speed, which is rewarded by Google, meaning your listing will be getting a tasty slice of the SEO pie. And, if you want even more of a boost, there are packages available that could see your business garner 7 times more views that a free True Local listing. Camex Automotive is a good example to follow. Their basic information and contact details are easy to find and read. They respond nicely to reviews, which leads to positive word of mouth and even more customers. Three separate deals are listed (we all love a bargain, and people are much more likely to book a service if they think they can get a special price on it), and they’re very open and clear about their exact services, brands, accreditations and vehicles. Providing plenty of information can make sure you drum up the right kind of interest, and you won’t get time-wasting calls from motorcycle owners if you only work on trucks. Finally, Camex has an excellent gallery stuffed with images of their work, so you can instantly see how good the team is at its job. A picture is worth 1000 words to potential clients, after all. Over a billion people use Facebook, and in conjunction with your True Local listing, Facebook can help you reach lots of potential new customers. It allows you to make regular posts about your work (impressive before-and-after pictures of a car you’ve been fixing, for example), and it’s a lifesaver for mobile mechanics who might have trouble advertising otherwise. You can comment on and message your customers directly, and never underestimate the power of shareability. If your posts are good, they could travel much farther and generate more interest than you ever thought possible. As a general guide, try to post a mix of photos, videos, text posts (under 100 characters for maximum engagement) and links back to your website to keep your followers interested, as well as improve your search engine ranking. Use Facebook’s insights to check on your posts performance and optimise until you find the sweet spot! Just look at Outlaw Mechanic. They post an engaging mix of sales messaging and fun stuff, as they’re very aware that too much of a hard sell will simply drive away followers. They often post on recent jobs they’ve finished to show their formidable skills, and they use Facebook to promote numerous specials and deals to convert casual viewers into paying clients. They also like to share relevant stuff from other parties, which is great if you want to update your page but you don’t have time to constantly create your own content. Lastly, they’re very responsive to messages, showing that they really value their customers. And, in the end, that touch of personal care is what a potential client is looking for. Your website is the first exposure that most people will have to your business online, and these days, most people expect a professional business to have one. It gives customers the chance to learn everything about you and establish if you fit their requirements. Your website is accessible 24/7, which means customers can learn about you outside business hours, making their experience as convenient as possible. It’s also a great tool for mobile mechanics as your customers will be able to reach you even though you don’t have a fixed location. Consider including an online booking or enquiry form on your site to ensure people can contact you at any time. It’s all about reducing barriers between discovery and booking. What’s more, if you take a few steps to ensure your site is optimised for search engines, you’ll be able to see an improvement in how high you appear in search engine results, which can have a direct impact on the number of people finding you, and, in turn, hiring you. 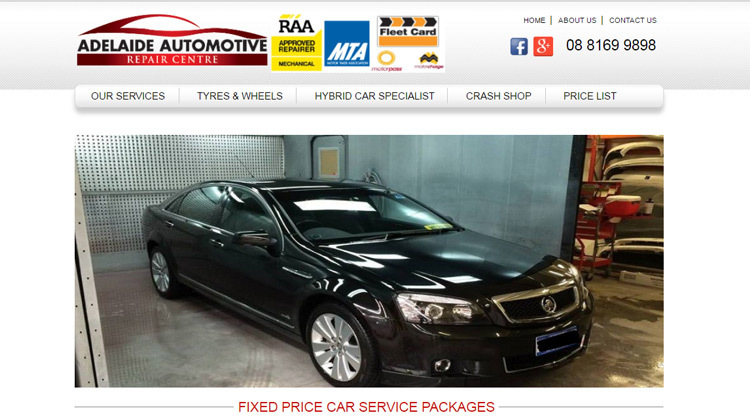 Adelaide Automotive Repair Centre has a website to be proud of, with an uncluttered layout and easy-to-navigate interface. This results in a good user experience, meaning people are far less likely to click away. 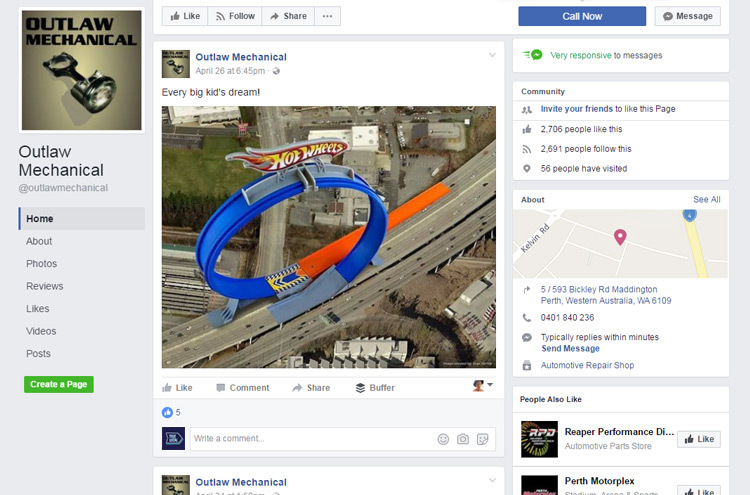 The phone number and social media links are included in the header for quick access, and you can immediately see deals and prices for common services above the fold (that means visitors can see the information as soon as they access the page, without having to scroll). The site actually features a full list of prices and services, which is the kind of upfront honesty that gets people on board. Before-and-after images are also a nice touch, showing just what the team is capable of. For more handy tips on making the online world work for your business, take a look at our business blog.